The North West Air Ambulance (NWAA) Charity has welcomed an Air Ambulance Response Unit (AARU) to its fleet, which the charity’s medical crew hope will provide a lifeline to patients in the region. 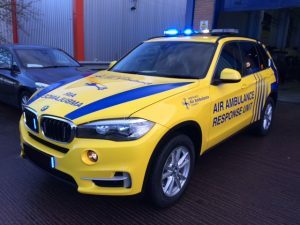 The AARU, decked out in blue and yellow to match the iconic livery of the three helicopters the service currently flies, will allow the charity’s paramedics and consultants to extend their hours of operation and significantly expand their service. While flight time legislation currently restricts the hours and conditions within which air ambulances can safely be flown, NWAA’s paramedics will be able to drive the AARU at any time, seven days a week, delivering emergency treatment to people across the North West in all weathers. The BMW X5 vehicle, which has been fully kitted out for medical use, comes in at £65,000. The unit was procured from the BMW Government & Authorities Division. The AARU is expected to have a lifesaving impact on patients across the region almost immediately; a trial vehicle has already proved to be a crucial transport link for critically ill patients, used in 24 missions by the crew to date. The charity is now looking to raise funds to purchase additional units, to give its patients the best possible chance at survival. Mark Evans, Clinical Service Manager for the North West Air Ambulance Charity, said, “Our team are highly-skilled in major trauma incidents and dealing with life-threatening medical emergencies, and are dedicated to treating patients whenever they need them – our service is ready to go 365 days a year. With this new vehicle, our advanced medical team will be able to bring their expertise to as many patients as possible, in a significantly increased timeframe. The AARU will also be essential in situations where we are unable to land our helicopters safely or when the weather prevents us from flying.